As we celebrate the 100th year of Libertyville High School, I can’t help thinking about the great players and coaches that have passed through these hallowed halls. Each individual has left an indelible mark on the young men who have followed in their footsteps. They have set the expectations for this program and year in and year out our young men have strived to meet those expectations. This program is more than just wins and losses. It is about the vast numbers of students that have moved through this program to become productive and successful adults who are contributing to our larger society. Who they are and who are current players become as adults is so important to us as coaches. How we treat other people especially those who are less fortunate is part of the reason why we complete a community service project each year. We are lucky to be in a community and school that is willing to lend their support to our endeavors. Our theme this summer has been repitition. In order to make every repetition in practice as important as every play on Friday night, we strive to have the speed, the commitment and the attention to detail that we would for a game. Giving that kind of focus is mentally draining, which in our opinion, is excellent training for the stress of a game. If we can make each practice as mentally and physically challenging as possible, then we like to think that the games will not be as stressful. 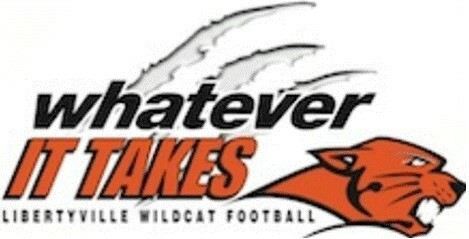 In closing, I would like to thank you for your support of Wildcat Football. It means so much to all of us that you make Friday night’s in Libertyville so special. You are helping to create memories that our players will cherish for years to come and we hope that in this 100th year of Libertyville High School, we can help to create lasting memories for you and your families and inspire the next generation of Wildcat Football players.